Rayford Lee is a native of Moss Point, Mississippi and a 2002 graduate of Tuskegee University with a Bachelor’s degree in business administration. Rayford served as the Corporate Sales Manager for HoneyBaked Ham in Montgomery for 8 years. 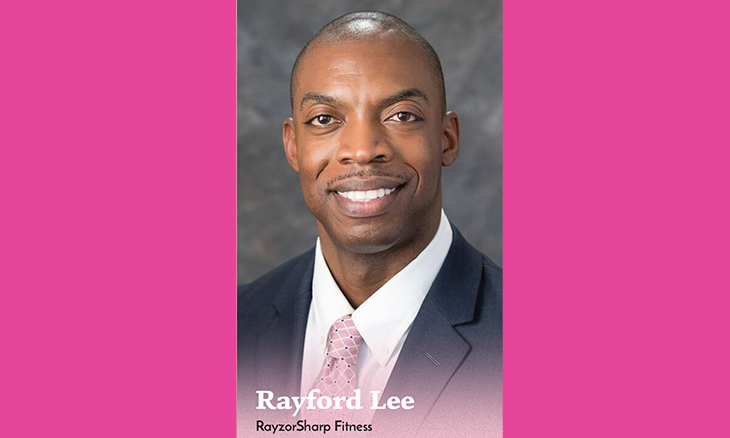 In 2014, Rayford followed his passion and began his career in fitness full-time by establishing the RayzorSharp Fitness Brand. As a group exercise instructor and personal trainer, he brings a level of energy and excitement to every workout. He has had the privilege to reach thousands of lives by teaching at River Region Wellness Center, the YMCA, AUM, Nshape, True Divine Seniors Center, and Metro Fitness, to name a few. He has been blessed to work with FootPrints Ministries, Joy to Life Foundation, Relay for Life, Medical Advocacy and Outreach, Hope Inspired Ministries, and other charitable organizations. Also, in 2014, Rayford began the 8 More Xtreme Workout in memory of his mother, Ruthetta Lee, who passed away of cancer in 2009. This event is now in its 5th year. Funds raised benefit the Montgomery Cancer Center and occurs on the first Saturday of August.